Every once in a while we’ll check in on the the guys at the shop to see what they’re up to. 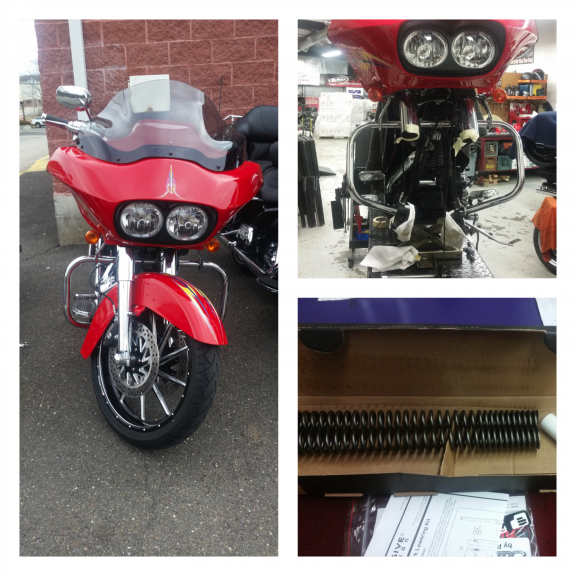 In the shop this week we have a 2010 Road Glide. The owner chose to lower the motorcycle for comfort. We installed the Progressive Lowering Kit which will allow the rider to stand flat footed and give a better front suspension compared to stock. Not every rider is comfortable with the stock height of their motorcycle. Often the bike will stand too tall for a rider which can be both difficult and dangerous, especially when coming to a complete stop on uneven ground. Sometimes this issue can be resolved by simply changing to a different seat which will cradle the rider in a lower position over the chassis. Changing or replacing a seat is, of course, quick and simple to accomplish. Purchasing a seat, however, will typically cost a considerable amount of money. It’s an option. Sometimes changing over to shorter rear shocks will lower a bike enough for a rider. Progressive shocks are always a solid investment for any bike. Check out the install video. Typically, however, most riders prefer the stance of their ride to be/look even; front to back, rather than gradually rising upward in the front. When it comes to front fork assemblies we always look to Progressive Suspension. Regardless of what you may want to accomplish, Progressive will not only have your ride looking good, but your bike will also ride smoother than it ever could with a stock Harley Davidson set up. We recently had this 2010 FLTR in the shop. The customer already had Progressive shocks in the rear which were one inch shorter than stock. The front wheel had recently been changed over to a 21″ to accomplish the custom look that the customer was looking for. This combination left the bike looking far too tall in the front. We lowered the bike one inch with Progressive’s Drop-in Front Fork Lowering System. We also decided to change fork seals at this time. We used James Gasket seals and Spectro fork oil upon reassembly. The bike now looks great and rides; well a touring bike can only handle so well with a 21″ wheel in the front. However, it is definitely easier to handle now that it is down 1″ with the Progressive assembly. Sometimes it’s alright to choose form over function. The customer loves this bike and doesn’t mind muscling in and out of corners. See the videos series on Chrome Forks and slider covers here. 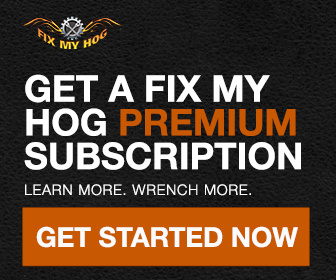 How do I install engine guards on my 2014 883 superlow? Harley Davidson and aftermarket companies offer engine gaurd assemblies for virtually every year and model. The guards are simple to install but the mounts & brackets differ greatly from model to model. You will need to purchase a kit specific for your year & model and follow the instructions. If you have any questions or issues during installation, please forward them to us. We will help you out the best we can. Depends on how you plan to ride. If you expect to be dealing with stop & go traffic, it would be more beneficial to install fans. In Fla, it would be most beneficial if you can add both types of systems, if your budget allows. so i would follow the basic same procedure for lowering my 2010 ultra classic? Is there a kit for a 99 Roadking Classic? I hardly ride anymore because I have a hard time keeping it up when I come to a stop. Hi Allen. Your best bet would be to look into Progressive Suspension. Shorter shocks in the back and lowering kit in the front. There are also different seats that will help your reach. I read your article and I like the idea of lowering the rear shocks but I don’t want to go to a 21″ wheel in the front. What do you suggest? We suggest lowering the front 1″ with a kit from Progressive Suspension. Keep your stock front wheel. Going with a 21″ front wheel on a Touring model is choosing form over function. Thinking about getting the S&S Cycle Silver 100″ Sidewinder Big Bore Kit for my 05 Road Glide, was wondering if the Vance & Hines Chrome Big Shot Duals Exhaust for the 88″ will still fit the 100″?